Emily Elizabeth Dickinson was a American poet. Unrecognized in her own time, Dickinson is known posthumously for her unusual use of form and syntax. Her quiet life was infused with a creative energy that produced almost 1800 poems and a profusion of vibrant letters, most of which was published after her death. The work that was published during her lifetime was usually altered significantly by the publishers to fit the conventional poetic rules of the time. Dickinson's poems are unique for the era in which she wrote; they contain short lines, typically lack titles, and often use slant rhyme as well as unconventional capitalization and punctuation. Many of her poems deal with themes of death and immortality, two recurring topics in letters to her friends. Her family had deep roots in New England. Her paternal grandfather, Samuel Dickinson, was well known as the founder of Amherst College. Her father worked at Amherst and served as a state legislator. He married Emily Norcross in 1828 and the couple had three children: William Austin, Lavinia Norcross and Emily. Emily Dickinson was educated at Amherst Academy (now Amherst College) and the Mount Holyoke Female Seminary. She was an excellent student, despite missing long stretches of the school year due to frequent illness and depression. Though the precise reasons for Dickinson's final departure from the academy in 1848 are unknown, it is believed that her fragile emotional state probably played a role. 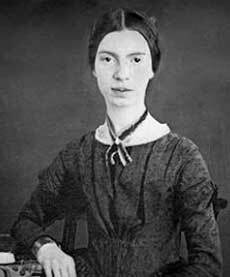 Emily Dickinson began writing as a teenager. Her early influences include Leonard Humphrey, principal of Amherst Academy, and a family friend named Benjamin Franklin Newton. Newton introduced Dickinson to the poetry of William Wordsworth, who also served as an inspiration to the young writer. In 1855, Dickinson ventured outside of Amherst, as far as Philadelphia, Pennsylvania. There, she befriended Charles Wadsworth a famous minister of the Arch Street Presbyterian Church, who would become a cherished correspondent. Among her peers, Dickinson's closest friend and adviser was a woman named Susan Gilbert. In 1856, Gilbert married Dickinson's brother, William Austin Dickinson. The Dickinson family lived on a large home known as The Homestead in Amherst. After their marriage, William and Susan settled in a property near The Homestead known as The Evergreens. Emily served as chief caregiver for their ailing mother from the mid-1850s until her mother’s death in 1882. (Neither Emily nor her sister Lavinia ever married and lived together at The Homestead until their respective deaths.) Dickinson's seclusion during this period was probably partly due to her responsibilities as guardian of her sick mother. Scholars have also speculated that she suffered from conditions such as agoraphobia, depression and/or anxiety. She also was treated for a painful ailment of her eyes. After the mid 1860s, she rarely left the confines of The Homestead. It was also during this time that Dickinson was most productive as a poet, filling notebooks with verse without any awareness on the part of her family members. In her spare time, Dickinson studied botany and compiled a vast herbarium. She also maintained correspondence with a variety of contacts. One of her friendships, with Judge Otis Phillips Lord, seems to have developed into a romance before Lord's death in 1884. Emily Dickinson died of kidney disease in Amherst, Massachusetts. She was laid to rest in her family plot at West Cemetery. The Homestead, where Dickinson was born is now a museum. Little of Dickinson's work was published at the time of her death, and the few works that were published were edited and altered to adhere to conventional standards of the time. Unfortunately, much of the power of Dickinson's unusual use of syntax and form was lost in the alteration. After her sister's death, Lavinia Dickinson discovered hundreds of her poems in notebooks that Emily had filled over the years. The first volume of these poems was published in 1890, with additional volumes following. A full compilation, The Poems of Emily Dickinson, wasn't published until 1955. Emily Dickinson's stature as a writer soared from the first publication of her poems in their intended form. She is known for her poignant and compressed verse, which profoundly influenced the direction of 20th century poetry. The strength of her literary voice, as well as her reclusive and eccentric life, contributes to the sense of Dickinson as an indelible American character.